So, it’s here, my empty nest moment. I’ve known it was coming for a while since I realised that by a simple quirk of fate, both of my children, even though they are almost 5 years apart in age, would leave home within a month of each other. The thing that strikes me the most is how they have taken their very essence and energy with them. Our house feels very empty and I wasn’t expecting that! I know there will be many new and wonderful things to come out of this; opportunities, experiences and more happy days when they are once again sitting round our kitchen table, telling us about their lives, but right now it’s quite a challenge as I learn to accept the ending of my most important and creative job. My friends who are a bit ahead of me tell me how parenting is never over and they come back, and I know that, but what is over is the ‘knowing’ of how they feel in the day to day, the sharing of triumphs and disappointments as they happen, the casual, but important, conversations late at night just when you are desperate to go to bed! Those memories make me want to reach back in time and hold their hot little hands in mine once more. I have watched with wonder and pride as they have grown from babies to toddlers to children to young adults and now they are gone to start their adult lives which is the right order of things of course. It has been a privilege you know, and I loved every minute. ‘Making’ sounds so much less serious than ‘creating’ and because I could be ‘making’ a cake or ‘making’ a bed, it isn’t loaded with expectation about making something wonderful and perfect and all of us makers can live without that pressure! The clay feels cold and inanimate when you first pull it out of the bag but it soon warms up and comes alive in my hands; every clay is different and you become familiar with the feel of each one. The black porcelain is always wet and sticky but if you run your finger through it, it smooths out like silk. The white porcelain feels slightly dryer and harder to the touch but it ‘gives’ when you work it as if it’s capitulating in some way. I always start with a ball of clay in the palm of my hand and I never make anything bigger than I can comfortably create there because keeping an unbroken connection with the clay is very important to me. Sometimes, when people pick up my finished work they will place it in their own palm for a moment and this always thrills me; it’s where it started out and when they do that I feel that their hand slips into mine as the maker, just for a moment, and to me, that’s what ‘hand-made’ is all about. I won an award! As my Yorkshire Dad used to say, 'Well, you could have knocked me down with a feather!' It was the Makers Choice Award presented by North Devon Ceramics Academy and Studio at Clay: A Festival of Ceramics in Barnstaple, North Devon. There were over 65 other ceramicists there and I was totally blown away to be chosen. When they came over saying they had something to tell me I thought I had done something wrong; taken up too much space with my stand, parked in the wrong place, forgotten to pay my stand fee ...I guess it's inevitable that old habits die hard but this was a wonderful unexpected surprise and I am thrilled to bits and very proud! It's 12 months since I first showed my lustre and porcelain pieces at the Contemporary Craft Festival in Bovey Tracey, and what a lot has happened since then! This year I introduced my black clay pieces and I was also in the main tent which was so exciting. So many customers returned to add to their collections and it was lovely to see them again and talk about their pieces and where they had put them in their homes. Not for the first time did I think what a great world this is to be a part of. My stand was near two makers I have got to know over the last year, Helen Round Designs and Lucy Spink Jewellery and we had so much fun. This is definitely a big part of it all, the support and friendship and understanding of other makers who know when to offer you a bit of chocolate or get you a cup of tea when things are quiet on your stand for a moment and doubt creeps in (which it does regularly for everyone who makes things with their hands and hearts!) Almost the best bit of the whole thing is the setting up - we all spend hours creating our stands, having a laugh, sharing staple guns, steps, paint and spirit levels - until our stands are all perfect and ready to go. Then, as the show closes on the Sunday afternoon we start to dismantle and the whole site is empty within an hour as if it never happened and everyone is gone. Only it did happen, and it will again! Feeling lucky! Just sometimes a magical day comes along when the stars are aligned and things feel ‘right’! Literally about 20 yards from where I live there is a lovely but under-used square. The home owners and fabulous shop keepers who front the square raised a load of money a couple of years ago to turn it into a community space and it is still a rather well kept secret, but the recent arrival of Me and East, a glorious emporium of all things hand made is making a real impact on the area and turning it into a bit of a destination. This Saturday was the first Rotherfold Artisan Market, an intimate affair with a handful of local makers including lucky me, our wonderful local baker, The Almond Thief, organic food from The Kitchen Table and all curated by Me and East. Right from the off at 8am we all worked together, sweeping the square, putting up gazebos and umbrellas (rain was forecast but never really materialised until the very end when we were packing up and all got drenched!) and setting up our stalls. There was a steady stream of visitors; including many familiar faces, seen in the street, the shops, at the school gates, but perhaps never spoken to until now, as they visited our stands, asked questions, encouraged and enthused and bought, and, in many cases were amazed at the secret craft-based lives some of us have alongside our other jobs! There was music from local bands and buskers, delicious food and a lovely chilled party atmosphere. It felt like the coming together of a very special community, but then those of us who live here know that this is our very unique little town at its absolute best. I loved every minute of it and I can’t wait for the next one! Recently I have had three commissions for wedding presents and one as a christening gift. It's always such a privilege to make pieces for people who are giving them as gifts and it made me think about the work I do and the bright lustres I use and how magical they are. Weddings and christenings are about new beginnings and families and friends; they are an excuse for us all to shine, to make the best of ourselves and celebrate together whole-heartedly. It's lovely to think that the pieces I've made by hand and with love will be a tiny part of these four special celebrations. Sign up with your email address to receive my journal posts. My grandmother had a large collection of 'fairings' which fascinated me when I was a child. Fairings were given away as prizes at fairs in Victorian times; they were literally two a penny, little china models that told a story, some were cheeky, maybe with a newly married couple climbing into bed, many featured animals such as a family washing the dog in a bath tub, there were mothers with naughty children misbehaving and women with new babies. Some were coarse and very badly made, others were completely exquisite, beautifully painted and definitely special. As a child I loved these little china ‘stories’ and characters, spending hours looking at them as they stood in a row on a low bookshelf in my grandmother’s house, my childlike imagination flying about as I secretly touched them with the tip of my finger, even though I wasn’t allowed to. They are all long gone now sadly but when I recently spotted one in a junk shop in Lyme Regis I knew everything about this tiny model as if I had seen it yesterday, and for £2.50 it was mine. I realise that, over time, objects in our everyday lives become almost invisible, over familiar maybe, and I wonder … is this because we stop ‘seeing’ them or is it because we stop ‘looking’? This experience of seeing a fairing I knew so well made me look with fresh eyes at some of the most precious china I do have and by properly looking at these pieces I saw things I had never noticed before. What I appreciate most of all though is the incredible artistry, craftsmanship and skill that has gone into each and every one. At the end of December I spent two days participating in a Christmas Fair close to home at a tiny village called Landscove. For me it was particularly poignant because my children went to Landscove Primary School, so every twist and turn of the the journey up there, almost to the edge of the moor, is full of memories and totally ingrained in me and it was an unexpected joy to drive through those lovely familiar lanes again. As I unpacked my car and got ready to set up I thought, not for the first time, that there is something really special about other makers; they are all so lovely, friendly and supportive and this is partly what makes this such a rare world to inhabit. It has been a busy year for me and I found myself looking back over it as I laid out my pieces in a way that has become second nature; it struck me that I've only been showing my ceramics in public for a year and I've only been making for three, so I guess I've come a long way. But it's still very hard to sell my own work confidently and there's a real knack to it. Deciding whether or not to make eye contact, start up a conversation or just be cool and say nothing because I don't want to be irritating but then risk looking like I don't care if they buy or not, makes the whole thing so unbelievably hard to judge! Now when I visit lovely events like this I have so much more understanding for the makers who have laid their hearts and souls out on a table for all to see. I always say hello, chat and ask questions and compliment their work and stand even if I don't buy. So I want to say a huge thank you to everyone who has been interested and friendly and encouraging and stopped to chat whether they have bought or not, I really appreciate it. I've had a great year and I've been very lucky to meet so many fabulous new people, and reconnect with old friends too, not least meeting up with my potter school-friend Louie who featured in a journal entry earlier this year. To everyone who bought from me, my heartfelt thanks for choosing a lustre-filled bowl that will hopefully bring you light. To my little band of journal followers, thank you for reading my thoughts and musings, feeding back to me and liking them. 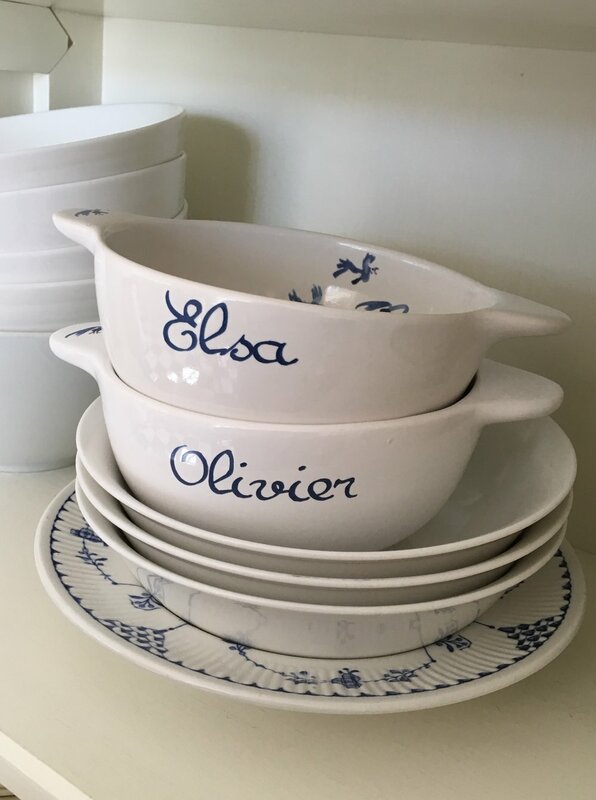 As a writer, this has been an important way for me to express my feelings about this new world of ceramics, and an important part of my whole creative expression, so it means a lot; writing and potting will always go hand in hand for me. Our world is full of challenges but hidden in there are surprises, magic and hope; I wish you all a wonderful shiny 2018! Verity's fabulous work! Made with guidance from the wonderful Mary at Crazy About Clay in Dartington, Devon. My daughter and her old school friend Verity were chatting in the garden. It was early September and they had dashed outside between showers with their mugs of steaming tea to sit on the damp garden chairs. Life is moving quickly now and these young women pass like ships in the night grabbing any precious time they can together as they set off on their individual journeys in different directions. I was on my way to my little garden studio and I stopped to ask Verity how her university course was going. I expected to hear about her final year ahead and her future plans as a speech therapist, but instead she said with undisguised excitement in her voice, 'I've decided I'm going to be a potter'. Like so many people she had picked up the clay almost by accident and instantly knew it was her thing. She is only 21 and I felt a spark of joy for her. It may not be a smooth journey but art is a gift and if you can include it in your life from the very beginning then you are more than lucky. I am a great believer in things working out for the best even if the patchwork of pieces seems fragmented at the time and nothing looks like it will fit; speech therapy and pottery might seem an unlikely duo on paper but to be honest, I'm not sure I can think of a better combination - both for herself and the people she will work with once she is qualified - I hope she manages to find a way to combine them both as she steps into her future. There is a theory that if you do something for 10,000 hours you will become completely proficient at it. I like this idea, even though it's a very daunting concept, but it also makes me think about how much we have allowed technology to do things for us and how little we have to 'do' anything these days. I have always been envious of people who have the discipline to learn a new language or skill and of course practice makes, if not 'perfect', then definitely 'progress'. I have been potting for three years now and I've kept quite a few of my early pieces; I like to look at them, partly because I am quite fond of them and their shapes but they also remind me of how far I've come. I was like a kid in a sweet shop with the clay at the beginning and I just couldn't get enough of the stuff; I pulled it, coiled it, flattened it, slabbed it, curved it and played with it for hours. Then just as I'd create a shape I half-liked I'd inevitably chip it or break it or a hole would appear in it and I'd have to recycle it, but all the time I was learning what worked and what didn't, what looked good and what looked, quite frankly, terrible! Even now when I pull a piece of sticky wet clay out of the bag it seems impossible that it might become a gold or platinum lined bowl, but I have practised and practised, experimented with form and shape and glazes and lustres until I have made something, out of nothing. I didn't set out to do this, it was more that my discovery and love of working with clay overtook me, but it has made me think; anyone could do this, anyone could learn something completely new at any point in their life from a standing start and I wish I had tried more things earlier in my life. Wouldn't it be great if everyone could step out of their comfort zone, try something new and just keep going, getting better and better until they can see the magic unfold. Like any form of art, people fall into two camps with the clay. There are those who can't wait to get stuck in and make something and those who won't even touch it. They will say that they can't do it, that they can't make anything, that they are rubbish at it and I really get this because, many years ago, I was that person! I went on a creative workshop day and I was horrified to be given a chunk of clay - even just holding it felt too much - I simply didn't know what to do with it but the wise teacher told us all to close our eyes and let it do what it wanted to do and, to my amazement, something truly unexpected appeared. It is true that working with clay can be exposing and take us to a vulnerable space where, by its 3D nature, we are going to make a shape which will be an expression or statement or a beginning of something so, if someone is really reticent, I would just give them a chunk to hold and tell them not to work it but just to feel it in their hands. But they can't do nothing of course, because it simply isn't possible to 'just hold' a piece of clay, it won't let you - eventually you have to pinch it or indent it with your finger or squeeze it; it makes you work it and perhaps that's why it's scary stuff. I wonder if sometimes the clay knows our secrets and the moment we let go and relax, then just what we need to express will appear, and it's often an accurate reflection of who we are at that moment in time, often surprising, sometimes moving, but always beautiful. So exciting to see my work in this advert .... also featured is the Foraging Necklace with little bird by Julia Parry Jones. So much has happened in the last year! The first time I sold a piece of my work to someone I didn't know was completely thrilling and, quite honestly, it still is. Showing at The Contemporary Craft Festival at Bovey in June was another first and opened up a whole new world for me. I met other lovely 'makers' for the first time and their encouragement, enthusiasm, creativity, integrity and beautiful work blew me away. Since then we have all continued to support each other and share ideas and inspiration on Instagram, and many of us will meet up again at Made by Hand Wales in Cardiff on November 3 - 5. Today has been another first, after a whole weekend of photography, caption writing, measuring and pricing, you can now find me on madebyhandonline.com, possibly the most prestigious on-line shop for makers there is. What I love about this site is the way they champion the designer makers, giving them a brilliant platform and a voice and this really brings their exciting and unique work to life. I feel privileged beyond measure to be a tiny part of this fabulous world of completely beautiful hand-made things and I'm loving every minute of it! Thank you! You will receive a monthly newsletter of my journal on the 1st of every month. There is currently an installation at Tate Modern where anyone can have a go at 'slip casting', pouring liquid clay into a mould and leaving it to dry before moving on to the next stage. You are definitely on a bit of a conveyor belt, zipping through the process, but it's so exciting to experience making something in clay from start to finish; even if the final piece you take home isn't the one you started to make ... someone else will eventually have yours further down the line. At times like this I wish I lived closer to London and could pop along to have a go myself because I've never done slip casting, but for now I'll have to make do with my usual hand-building. Three things in particular struck me about this brilliant idea; the first is that two of the of the main potters and contributors are in their 80's and still potting, still making and creating. This is so wonderful! How many people can still do what they love in their 80's? The second is the row of 'potters' of all ages experiencing something creative and new for the first time individually, but also, strangely, as part of a team, and thirdly, the 'slowing down' you experience as you tap into the world of making.. This is what creativity does to you, it takes you to a calm place and hours can pass without you even realising. Bliss. "Ah, you've chosen one of my 'dancing mugs" said potter Ema Ramanskaite, putting her hand over the top of it and gently rocking it round and round, "when I pour someone a cup of coffee in one of these. they just naturally roll it around under their hand, it's not even a conscious gesture really, but everyone does it!" I was in Margarites Village high up in the mountains of Northern Crete, the hub of this Greek island's pottery-making industry, and I had fallen in love with a mug. Ema and I got talking and she explained her influences and inspiration; Eastern European by birth she had come to Crete as an au pair and then became a potter. It sounds a bit random but it doesn't surprise me, I hear stories like this all the time, if you are meant to be a potter it will get you in the end! The beautiful mugs and bowls she makes with their curved bottoms are influenced by the Minoans, and she told me she had spent months in the museum at Heraklion gazing at the wonderful shapes there and then going home to practice and practice until she perfected this difficult design. I had never really thought about my bowls and their own curved bottoms before because that's just the way I naturally make them in my hands, but looking at Ema's work, and her inspiration I couldn't help but feel a connection. When I'm working on my own pieces, feeling my way and smoothing their underneaths, their balance point will suddenly appear and then I know I'm there. Looking at these beautiful contemporary shapes with their ancient heritage, it struck me that nothing is new, everything returns to something that came before, and I find that fascinating and deeply reassuring. I have always been fascinated by detail. I love to pore over old family photographs looking for hidden things; tiny clues to a way of life long gone. A brooch or a hint of a lace collar, a silver topped cane, a top hat or a pair of gloves with buttoned cuffs. The sadness is that most of these actual items are no longer with us but I think that we have a responsibility to try and keep important things safe for future generations if we can, and to make sure we remember to tell their stories so their history stays alive. Last summer two beautiful and elegant Leeds Cream-ware sauce boats came my way out of a clear blue sky. I didn’t know their history but I have since discovered that they had been in my grandmother’s family for many years and for some reason, around the time of the second world war, she gave them away to my godmother’s family. Perhaps they said they liked them, or maybe they were all that remained of a full dinner service and my grandmother didn’t want them anymore, but for whatever reason their story went with them, and when my godmother’s house was cleared and sold she left instructions to make sure they were returned to me. These sauce boats are so beautifully made that the skill and detail, especially around the handles is, quite honestly, astonishing. When my grandmother owned them they would probably have been kept in a cupboard in their kitchen and brought out once a week for Sunday lunch, filled to the brim with gravy, hollandaise sauce or custard. I don’t know what happened to them in the intervening years and I don't suppose I ever will, but they have come home again now and they sit in pride of place on our mantelpiece. I feel privileged to have them. When I was in my late teens I was invited to spend a week with some distant cousins from the South I had never met before. I really didn’t want to go and I felt like a parcel being passed down the country from Yorkshire to Cornwall. I was collected from the train in Hampshire for the last bit of the journey by the dad; he was warm, kind and chatty, and in spite of my shyness and nervousness about the week ahead, I began to relax. I had never been further south than London and as Hampshire turned into Somerset, then Devon and finally Cornwall, the countryside changed in front of me. I saw hedgerows full of wind-blown trees all leaning in one direction as if the world had been tilted for a moment and they had stayed there. I saw ancient stone churches nestled into the curved landscape, their spires standing out against the blue sky like pairs of rabbit's ears, and then, as we drew closer, glimpses of sparkling water where the sky met the sea. Soon I would be warmly greeted by the rest of this huge family who poured out of the front door with dogs, smiles, hugs, tea and cake. As my cousin and I met for the first time that afternoon we felt an instant bond and later that evening we sat together on her bed laughing out loud and marvelling at our similarities … we were surname-sharing, diary-writing, guitar-playing, Laura Ashley-wearing, animal-loving, suntan-seeking 'cousins' …. suddenly the old saying ‘blood is thicker than water’ seemed full of joy and belonging to me. I didn't know it then but this was a family which, over the following years, would become as important to me as my own. That first magical summer in Cornwall was glorious and, because we were still young and free with no responsibilities, one week stretched to four; and lifelong friendships and memories were created across the generations that continue to this day. In their large farmhouse kitchen was an old Cornish pine dresser filled with the precious and the ordinary. It was the repository for notes, finds, pebbles, feathers, photographs, cards, reminders and of course china; this dresser was indisputably the hub of their family life, combining a sense of everyday casual with importance. I coveted this dresser and when my children were small and we lived in London I was lucky enough to get one of my own. I love it and it has been with us ever since, painted in different colours depending on where we have lived, but always packed with our 'stuff'. Mismatched glasses, china, jugs, mugs, plates and bowls that we use every day, and then the personal things ... at the moment there is an old Noddy eggcup, a postcard or two, hand-made flags on wooden skewers, a mosaic panel and a small metal fish. They don't mean anything to anyone else but we know their history and they are all part of our family story.